Some days are better than others. But any day with tomatoes can be a good day. Because when it comes to tomatoes, all things are possible. With or without tomatoes, one thing remains certain each day, that there is something for us to learn. 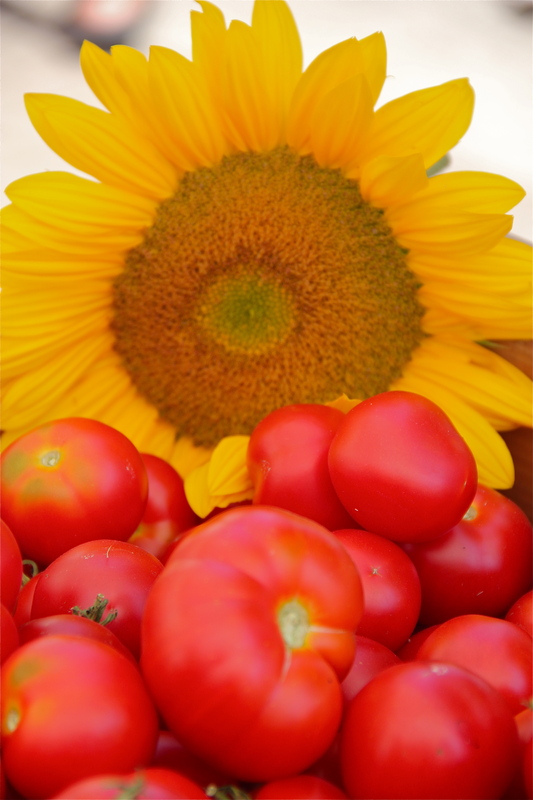 The day my boys and I went out to the garden to bring in summer’s first big haul of tomatoes, we learned just how heavy a tub of produce can weigh. Good thing there was three of us. My oldest son learned that he was not going to be rewarded for picking the green tomatoes. 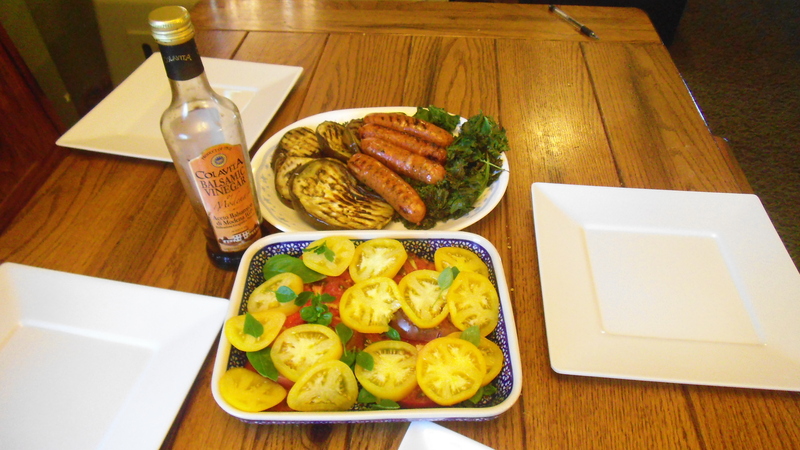 I learned that grilled green tomatoes are equally divine as their fried counterparts. Later that night, as a family, we had the opportunity to truly witness the fruits of of labor. 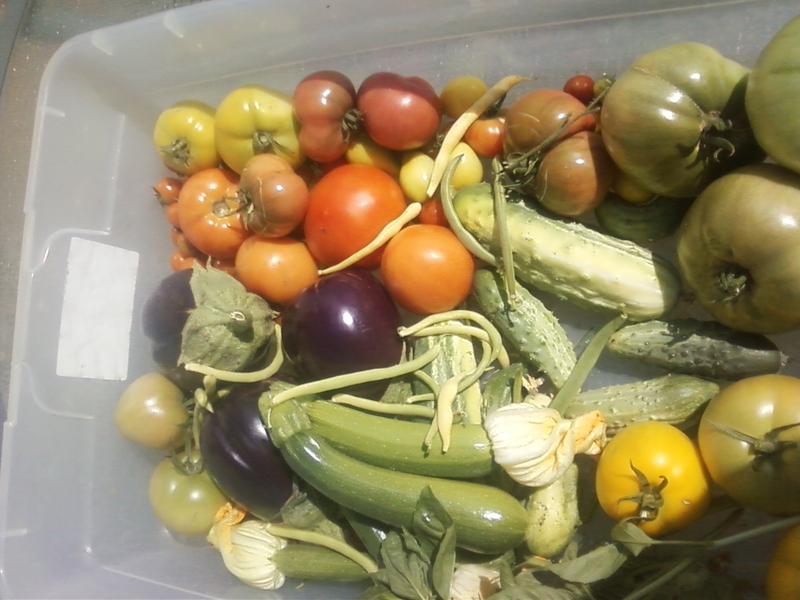 Six varieties of tomatoes had yielded nothing short of a bounty and in just a few days of steady summer heat. Our counter tops were full and we were blessed with tomatoes. Tomatoes from our garden this summer! We had a plan, sort of, to savor every ounce of homegrown goodness. Cherry tomatoes were for fresh eating. They sat in a bowl. Ready for snacking. They went fast. Even though my youngest son preferred the mellow and sweeter flavor of yellow pear tomatoes. To his despair, those have another purpose. 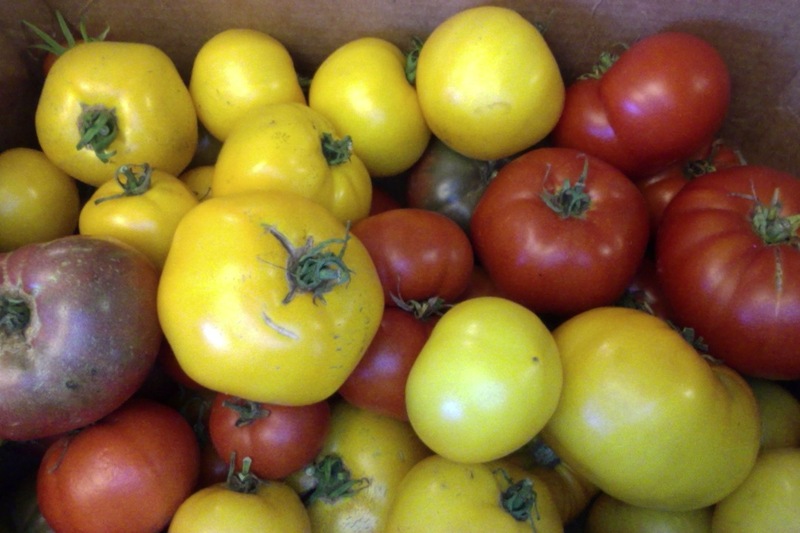 We grow the profusely abundant yellow pear tomato with one purpose in mind, to make yellow-tomato basil jam. Yes. Jam. It is sweet and savory and delivers a strong essence of summer. We first came upon this recipe in the wonderful cookbook Preserving the Harvest. Last year, I learned that it is best to prepare this divine preserve in small batches. The two hour cook time for a double batch simply does not work. This year I learned that using Greek Basil takes the jam to a whole new level of delight. While the recipe is time consuming it is not difficult. The hardest part is waiting to enjoy this. But it is the darkest days of winter that benefit most from a little sunshine in a jar. Next on our priority list was to use the very very ripe tomatoes as soon as possible. I paired the tomatoes with garlic, onions, kale, and a pinch of red pepper and served it over grits for dinner. I am, at heart, a girl of the southern states. Grits are a part of that, but the dynamic flavor of vine-ripened tomatoes cooked down to a sauce and topped with crispy kale leaves… ooh goodness. I felt like I was home. Along side of the dinner preparations was another preservation project for late summer months: tomato juice. I cut and cored my tomatoes, put them in a pot with a little onion, salt, and celery and mash and boil, mash and boil until it is all a pretty red mash of savory goodness. Then I add a handful of parsley for an extra boost and let simmer for a bit. Typically I prefer to use the yellow lemon boy tomatoes for this juice recipe. But it is a good way to use up lots of well ripened tomatoes up quickly, so this was a bit of a mix. I then strain the juice through a sieve and bring to a simmer again. The tomato juice can then be frozen for later use, cooled and enjoyed, or if I plan on preserving it in a water bath canner, I test the pH and add lemon juice to ensure the juice is acidic enough for safe canning. In less than 24 hours we had taken care of at least half of the tomatoes. But there were still more. We needed to act fast, or the invasion of fruit flies would begin. But the next day would be a new day. As we started our new day, I was thinking about tomatoes and teaching. After all, we had begun our first official week of homeschooling. It hit me then- Tomatoes can be a teaching resource! I led my first grader through the process of sorting the tomatoes. We talked about plant varieties and characteristics. 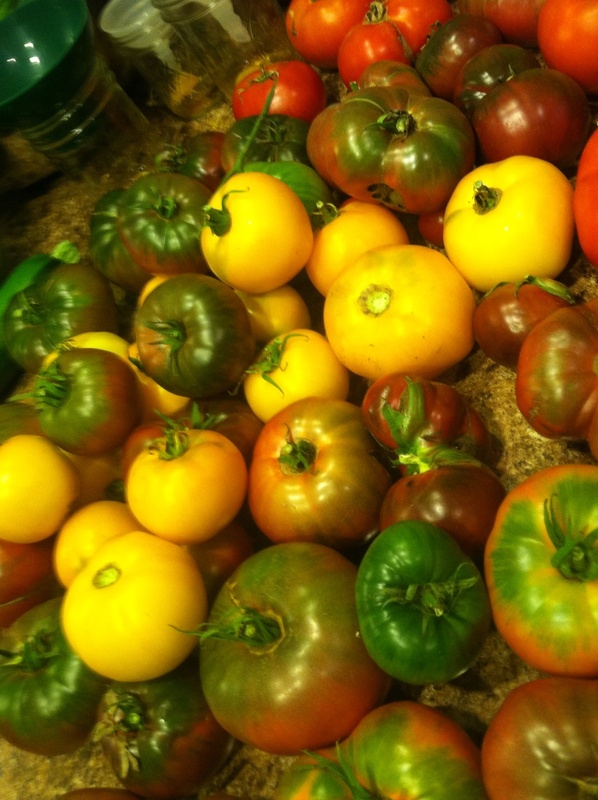 We distinguished Cherokee Purple from Black Krim based on the fruit shape. We distinguished Champion from Better Boy based on color variation. Thus leaving the Lemon Boys as the last option for those left behind through process of elimination. We began counting our categories, using a simple spreadsheet to track our data. And then weighed the total of each variety. We even got to venture into decimals. The boy clearly got it when he said, “So 6.25 pounds of tomatoes is a lot like $6.25, right?” Right on my boy, right on! If tomatoes were currency, we may be rich. When it was all said and done, we were able to determine which tomatoes we had the most of by number and weight. And even toyed with the idea of averages. 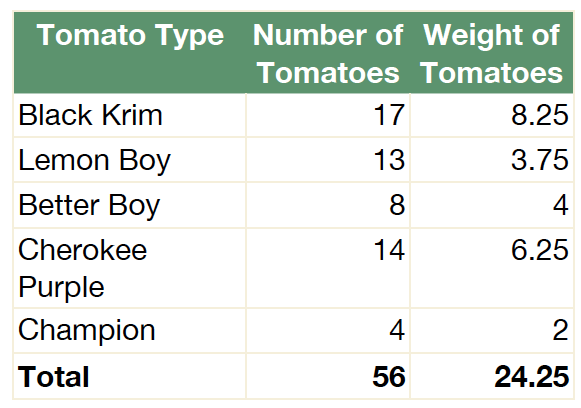 On average, the Champion tomato weighed the most, followed closely by Better Boys and Black Krim. Cherokee Purples came in close behind. The lemon boys had by far the lowest average weight per tomato. We had good fun, and I gained confidence in my homeschooling abilities. We sliced two tomatoes and shared them for a snack when we were done. Because what fun is tomato math without taste testing. 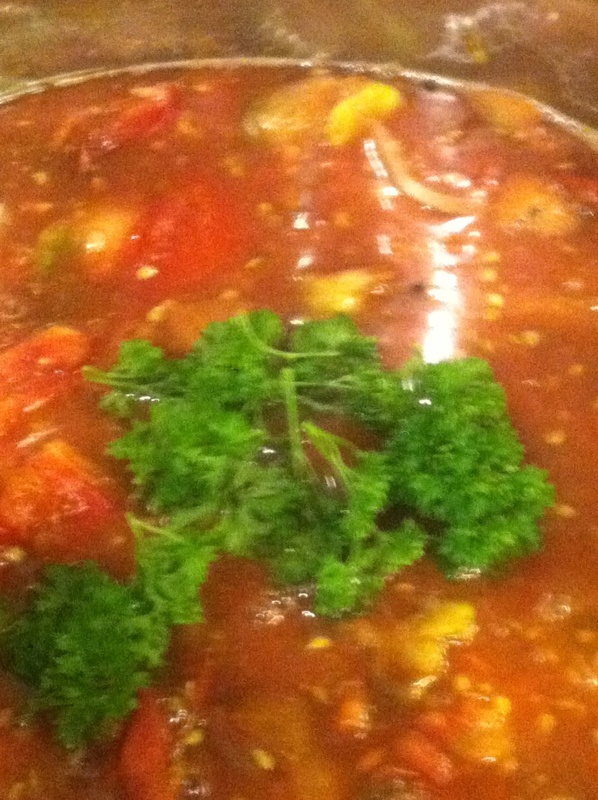 The next day, we tackled another priority on our list– salsa making. Twelve pounds of tomatoes went into the salsa. 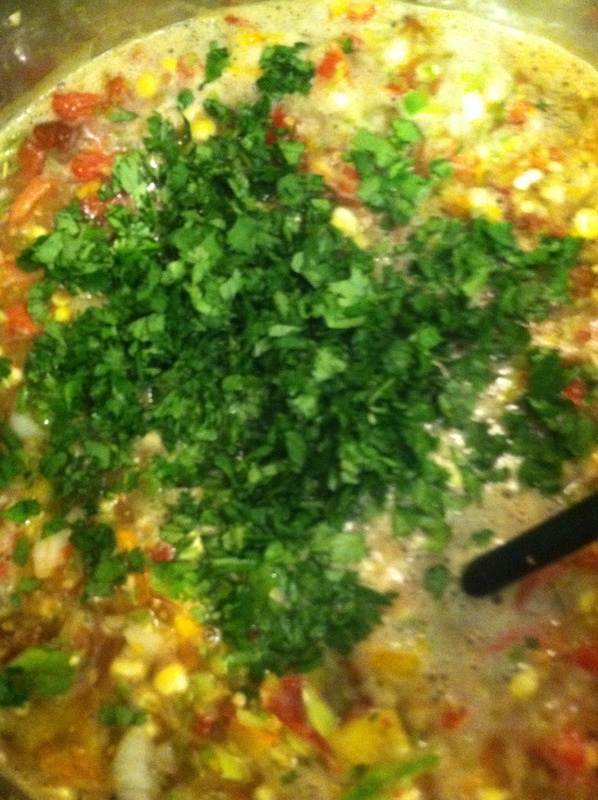 Along with peppers, onions, corn, white wine vinegar, coriander, salt, and cilantro. Oh how I love the cilantro! When the salsa was done, I was astonished by the flavor the variety of tomatoes contributed. But I was so sad to see how pale the salsa was. Sure I used yellow tomatoes, orange peppers, and sweet corn, but the finished product was so less than vibrant. Then it hit me… I had forgotten one ingredient I had added to last year’s recipe: paprika. Paprika makes the salsa red. Well, this year, we’ll just have to learn how to love a flavor loaded, color muted salsa. Finally, our tomato harvest became manageable. We prepared what was left for dinner, returning to our love of tomatoes and basil. Because some pairing never grow old. This cycle will continue for the next few weeks as tomatoes ripen. 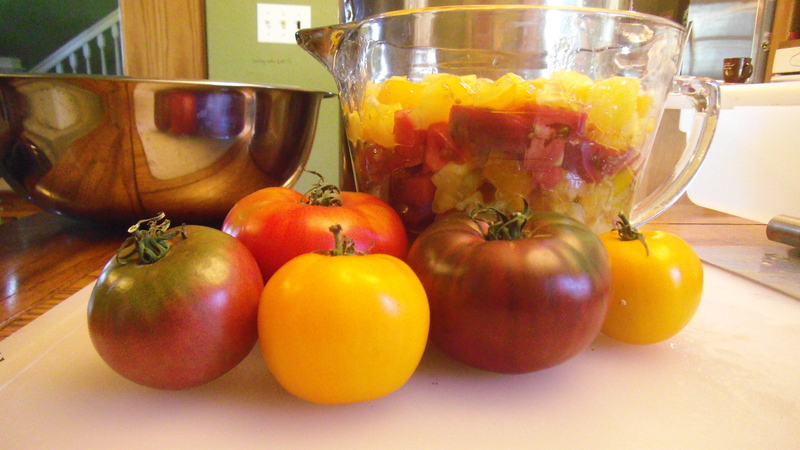 This weekend we will likely prepare another batch of jam and some yellow tomato juice. We’ll likely try something new like homemade ketchup and eventually we will begin canning crushed tomatoes for winter spaghetti dinners. Along the way, we will have some fun. Enjoy the bliss of summer’s end. And learn something new, everyday. Posted in Appreciating the Moment, Cultivating the Soul and tagged food, garden, herbs, learning, Local Foods, north dakota, Specialty Crops, Summer, tomatoes. Bookmark the permalink.